Yes, we chose a quiet close-to-home Christmas this year, venturing no further than West Sussex, but getting in on one of those age-old and inexplicable traditions that crop up all over the UK: they’ve been walking a horse through the bar of the Fox Inn in the little hamlet of Bucks Green for so long that nobody remembers when it started, or why. Staff at the pub said they believe it may have to do with keeping a bridleway open, though that’s just a guess. British ramblers (US: hikers) can be fiercely protective of their right to use public footpaths and bridle paths, which can bring them into conflict with landowners when owners and ramblers have different ideas of how extensive the public’s rights really are. Walkers, often from the Ramblers (a nationwide association), go past my house every once in a while, groups of people wearing plastic sleeves full of maps hanging from straps around their necks. They traverse all the local footpaths as a hobby, a form of exercise, and a means of asserting their right to keep those paths public and to make sure no one is threatening to close any right of way. On the other side of the fence (sometimes literally), landowners may close paths over private land a few days a year to remind people that the public has no right to pass. An old friend of mine in Essex had one of these—they’re called permissive paths—across his land, and used to close the gate on Christmas Day every year to remind people that while he was happy for them to walk across the land, his farm was private property. Blue in the pub, with lots of people to cheer him. You can just see the take-away menu on a chalkboard behind his head. 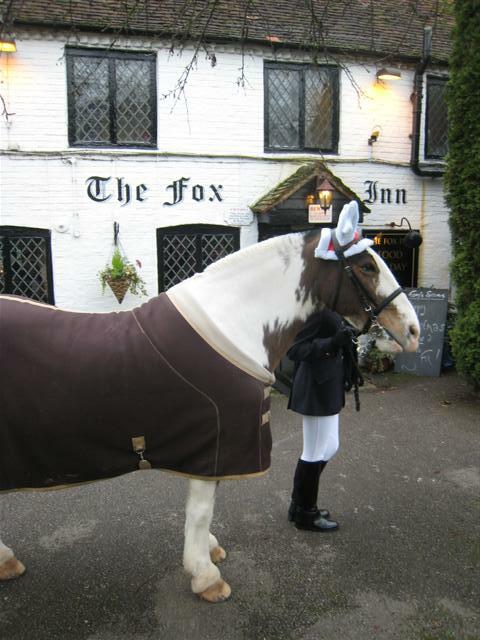 Which brings us back to Christmas, and to the Fox Inn where a horse—his name is Blue—visits for lunch at Christmas. There’s a brick path running right through the building; presumably that’s the old bridleway and at some point—by at least the 16th century, because the present building dates back that far—somebody plunked a pub down right onto it. So Blue comes in on Christmas day, eats a bag of crisps (US: potato chips), has a bowl of beer, and then walks on out the other side. Once outside, Blue posed for photos. He seemed to be a very good sport about those antlers. I followed him out to snap some more pictures because the pub was chock full of people and I couldn’t get close enough to the horse inside the building to get a decent photo, though a very kind (and very tall) stranger lifted my camera up over his head to take a shot over the crowd. I don’t know where all the people came from; Bucks Green is a small group of houses classed as a hamlet, an outlier of the thriving metropolis of Rudgwick, itself a village that can claim all of 2900 people (if they round up to an nice-looking number). Okay, this is the south end of a northbound horse, but his tailwas so beautiful I wanted to include a photo. Many thanks to the staff of the Fox, to Blue, and to Blue's handler. A good proportion of Bucks Green citizenry must have been in the pub that day. In fact, Blue’s handler had to persuade him at one point not to try go back in. Once is all it takes; even if no other horse ever walks up to the bar at the Fox, the bridleway is (presumably) safe for another year. That’s what I call a proper Christmas! Well chosen and well recounted. I bridled a little (no, not intended) at ‘rambler’ but then realized you’re absolutely right. In my youth, the 1940s, they were all ‘hikers’ though I suppose members of the Ramblers Association were already calling themselves ‘ramblers.’ Then, with the growth of intensive farming and ploughs that could work right into the headlands, farmers began to obliterate footpaths and the Ramblers took up the cudgels against them. The price of liberty … etc. And so the hikers of the first half of the century have become the ramblers of the latter half. There are bits of permissive path along the Cornish coast near Porthleven: not sure if they make up part of the coast path proper. There’s a sign saying you’re not allowed over the land on Christmas day, I think, but as there’s no gate or indeed anyone very near, it’s just a legal safety net so it can’t become a footpath. Continuous access can be REALLY important. There’s a scrap of land between our boundary wall and the road edge proper that doesn’t belong to … anyone. Probably the GPO when it existed, since it was home to a post box and phone box. Before buying, we had to have an old parishioner swear a statement that there had always been foot and vehicular access over this 2m of scruffy gravel when the building was a working chapel. A few years back there were people who went around buying up old manorial titles and then charging people for crossing or parking on just such strips of land in front of their homes under mad medieval laws that have never been rescinded, just forgotten. I think the “lords of the manor” tended to lose in legal battles down the line, but a lot of lawyers got richer along the way. 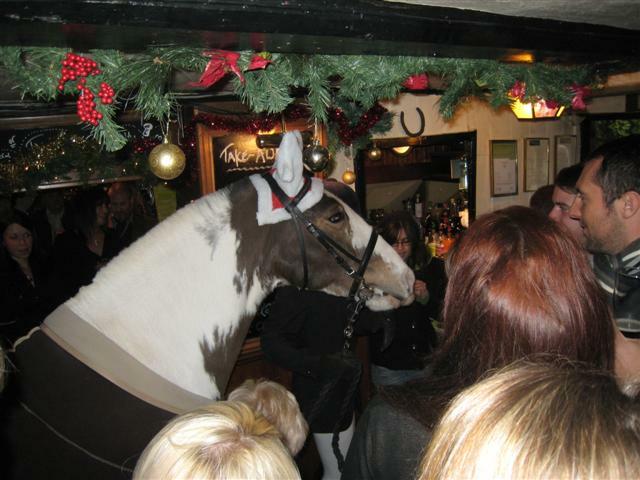 So the pub might even today be protected against predatory redevelopment for housing (for example) by Blue – a horse in the pub is a fun tradition, a path through the house or garden is less appealing. The most novel accommodation of a right of way I ever saw was some footpath up north, in the Pennines or Cumbria. It ran right alongside a house whose owners wanted to build a “granny annexe”, but there were objections to moving the path – so they were allowed to build over it. Literally. The annexe connected with the main house on the upper storey only, with an open walkway below for the path to go through. It was the only shelter on the path, and they said walkers did tend to loiter in there a bit in heavy downpours, which strictly speaking you’re not supposed to do, but it was all very friendly. 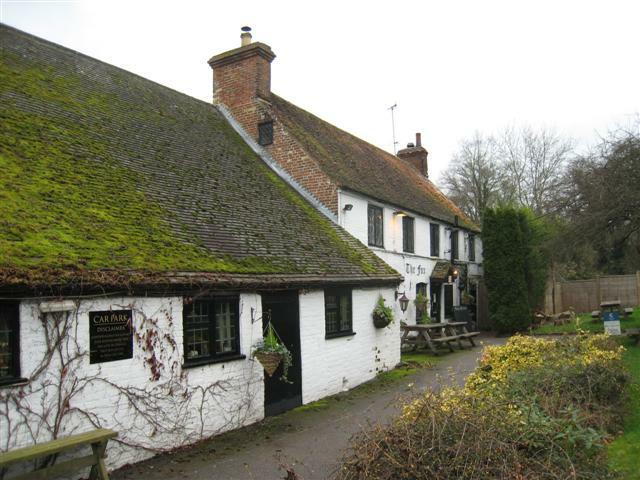 As you know, my local is The Fox Inn. 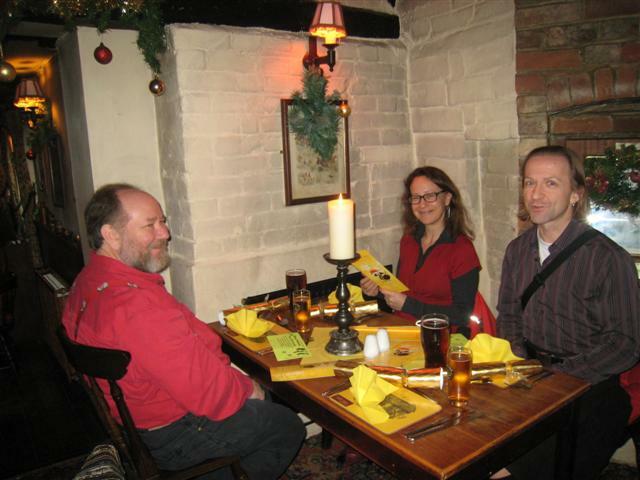 Glad you had a good time there with Ernest, Jocelyn and her hubby, (Ian)? I hope the Christmas lunch was up to snuff. Blue comes from the livery stables just up the Loxwood road, behind which a permissive path runs through delightful woods for about two miles. The local diobervesity group, volunteers all, have worked for several years laying down tracks for dogwalkers along streams that flow into the river Arun, building little wooden bridges,settles for the weary and planting a host of fruiting trees. The path was closed for the day on the 31st December and doubtless, those dog walkers like myself who were denied its use, found themselves in The Fox. Not a bad alternative on such a wet day. Bertie couldn’t understand why his ritual walk was curtailed and spent the afternoon in the pub being stroked and oohed and aahed over. 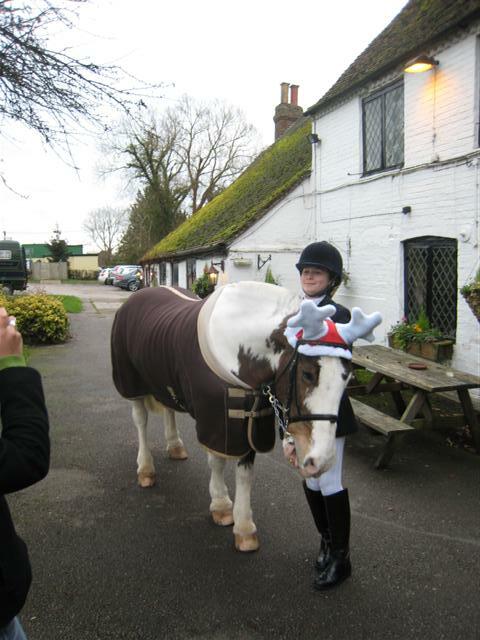 If you hadn’t told me about the horse-y tradition at your local, I never would have known in the first place! But I thought you were in Spain — please don’t tell me that you were at home for Christmas and I was within walking distance of your house and didn’t see you. Nice post Mef! Have had experience of right of way on property and not in a good way. Had an auctioneer promise us one thing and write a letter to another person confirming the very opposite. Details, please! What kind of crisps and beer did Blue tuck into? This is all so much more colorful and fun than the holidays in the US. We have no bridle trails running through our dining establishments, nor are dogs generally allowed, either. A handful of understandably jittery reindeer are imported as part of the National Christmas Tree display in front of The White House, but that’s about it. Why does everything in England seem so much more colorful? Many thanks for ALL comments, you’ve left me lots of interesting info. It’s also interesting to see where the comments are coming from, as–if I’ve got details right from previous comments or conversations–they’ve come from an Englishman living in Ireland, someone raised in Ireland but living in England, an Irishman, an Englishman who grew up in Pakistan, and an American — so my shorthand way of describing this blog as “about English life, mostly for Americans” would seem to be, er, wrong, but all are from people who are living, have lived, or have always lived outside the UK. 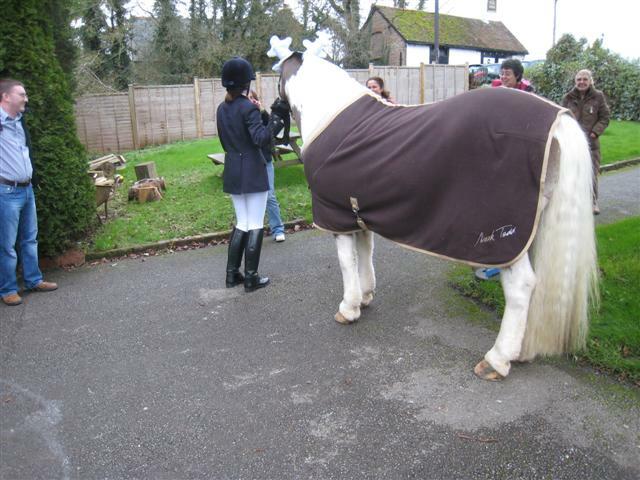 Candida, it hadn’t occurred to me that keeping the bridleway open would make it impossible for the site to be developed against the wishes of the residents or the landlord. Just another example of how the long history of law in this country still makes a difference. And with your right-of-way troubles, it sounds like you and Seamus would have a lot to talk about. Seamus, I’m interested that this info came from an auctioneer; in our part of England, anyway, such assurances come from an independent surveyor, whom you have to pay. I had a rotten one of those one time, who sold the report I paid for to another prospective buyer of the same house, so the profession isn’t without its bad apples, for sure. The friend I mentioned who closed the gate on Christmas (sadly, he’s no longer with us) did in fact by the manorial title, but he only used it for good–to support the revival of the local open-air market, and to keep out a gravel company that wanted to turn the common into a bit pit. The granny annex-with-overhead-passageway sounds way cool, and also reminds me of a place in Shrewsbury I snapped for my post on ancient black-and-white houses (https://mefoley.wordpress.com/2011/04/18/shrewsbury-in-black-and-white/), where the road goes through the building. According to the Ramblers web site, sheltering under your friends overhanging room is permitted, as long as those sheltering don’t obstruct traffic; you’re also allowed to stop just to rest, or to have a picnic, as long as everybody maintains the sacredness of the right of others to pass through. As for dogs in the pub, Bertie is a handsome beast and would be welcome anywhere, though the day he took the toggle of my coat in his mouth and wouldn’t give it back was not his finest hour… 🙂 Come to think of it, the handsome Bertie is an import to the UK from Ireland, too! Finally for Martha, I don’t know the kinds of crisps and beer Blue snacked on, alas. And flavours of crisps is really worth a post all by itself. Why does everything in England seem so much more colorful? Two reasons: because the long fingers of British history that still reach into the present make for brilliant contrasts and for a cockeyed way of looking at things compared to the perspective of most Americans, and because, as Herb Cain used to say in the San Francisco Chronicle, everything imported is domestic somewhere. You might be surprised how colourful visiting Brits would find your neighborhood!